Sayat-Nova (Armenian: Սայաթ-Նովա; Persian/Azeri: سایات‌نووا; Georgian: საიათ-ნოვა) (14 June 1712, Tiflis – 22 September 1795, Haghpat), meaning 'King of Songs' in Persian, was the name given to the Armenian poet and ashik Harutyun Sayatyan. His mother, Sara, was born in Tbilisi, and his father, Karapet, either in Aleppo or Adana. He was skilled in writing poetry, singing, and playing the kamancheh. He performed in the court of Heraclius II of Georgia, where he also worked as a diplomat and, apparently, helped forge an alliance between Georgia, Armenia and Shirvan against the Persian Empire. He lost his position at court when he fell in love with the king's daughter, and spent the rest of his life as an itinerant bard. In 1795 he was killed in Haghpat Monastery by the army of Agha Mohammed Khan, and is buried at the Cathedral of Saint George, Tbilisi. About 220 songs can be attributed to Sayat-Nova, although he may have written thousands more. Most of his extant songs are in Armenian, Georgian, Azeri Turkic and Persian. A number of them are sung to this day. He was also fluent in Arabic. Sayat-Nova is considered by many to be the greatest ashik (folk singer-songwriter) that ever lived in the Caucasus. Composer Alexander Arutiunian wrote an opera called "Sayat Nova". There is a street and a music school named after him in Yerevan, Armenia, as well as an Armenian-American dance ensemble in the United States, and a pond located in Mont Orford, Quebec, Canada. The 1968 film "Sayat Nova" directed by Sergei Parajanov - which was banned in the Soviet Union - follows the poet's path from his childhood wool-dying days to his role as a courtier and finally his life as a monk. It was released in the United States under the title The Color of Pomegranates. It is not so much a biography of Sayat Nova but a series of tableaux of Armenian costume, embroidery and religious ritual interspersed with scenes and verses from the poet's life. 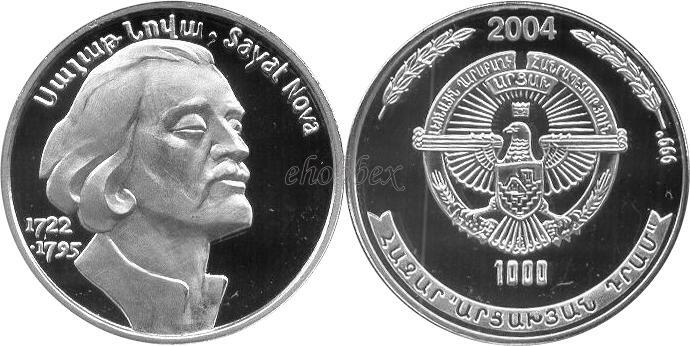 In Armenia, Sayat Nova is considered a poet who made a considerable contribution to the Armenian poetry of his century. Although he lived his entire life in a deeply religious society, his poems are mostly secular and full of Romantic expressionism. A book on his life and work by Charles Dowsett was published in 1997 titled Sayat'-nova: An 18th-century Troubadour: a Biographical and Literary Study. On October 14th, 2006 Grigor Shahmuradyan & his wife Gayane Minasyan prepared an outstanding performance in memory of Sayat-Nova's 300th anniversary. Songs were sung by Grigor and Gayane told the life story of Sayat-Nova. The evening will be repeated on September 14th, 2008.